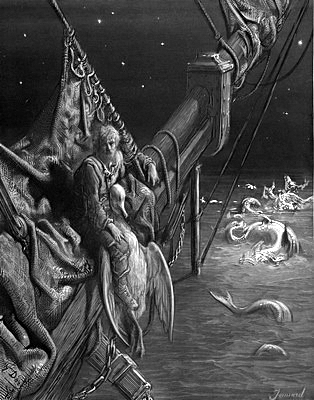 The original story of "The Ancient Mariner" was written several centuries before "The Rhyme of the Ancient Mariner" was added to our literature. The story of Noah and the Ark is loved and appreciated by multitudes who have never gone to sea, or taken an ocean voyage. This is the story of a righteous man, a great preacher, but essentially a great man of faith. There are many wonderful lessons we can learn from this sacred story of a man who obeyed God by heeding the storm warnings! Let's look at the story in God's Book. "And Jehovah saw that the wickedness of man was great in the earth, and that every imagination of the thoughts of his heart was only evil continually. And it repented Jehovah that He had made man on the earth, and it grieved Him in His heart. And Jehovah said, I will destroy man whom I have created from the face of the ground: both man, and beast, and creeping things, and birds of the heavens; for it repenteth Me that I have made them. But Noah found favor in the eyes of Jehovah. ... And God said unto Noah, The end of all flesh is come before Me; for the earth is filled with violence through them; and, behold, I will destroy them with the earth. Make thee an ark of gopher wood; rooms shalt thou make in the ark, and shalt pitch it within and without with pitch. And this is how thou shalt make it: the length of the ark three hundred cubits, the breadth of it fifty cubits, and the height of it thirty cubits. A light shalt thou make to the ark, and the door of the ark shalt thou set in the side thereof; with lower, second, and third stories shalt thou make it. And I, behold, I do bring the flood of waters upon this earth, to destroy all flesh, wherein is he breath of life, from under heaven; everything that is in the earth shall die. But I will establish my covenant with thee; and thou shalt come into the ark, thou, and thy sons, and thy wife, and thy sons' wives with thee. And of every living think of all flesh, two of every sort shalt thou bring into the ark, to keep them alive with thee; they shall be male and female" (Genesis 6:5-8, 13-19). Noah has a magnificent place in the gallery of God's faithful men, as portrayed in the 11th chapter of Hebrews. After defining faith in Hebrews 11:1, "Now faith is the assurance of things hoped for, a conviction of things not seen," the inspired writer begins giving glorious examples to illustrate the workings of faith in deeds of obedience. Among the heroes, "Who through faith subdued kingdoms, wrought righteousness, obtained promises, stopped the mouths of lions, quenched the power of fire, escaped the edge of the sword, from weakness were made strong, waxed mighty in war, turned to flight armies of aliens" (Hebrews 11:33-34) -- yes, there in the midst of those heroes stood Noah, a great man of faith. Even in this illustrious "hall of fame," Noah stands forth with some prominence, for he is one of the best known and most loved of those Bible heroes. "By faith, Noah, being warned of God concerning things not seen as yet, moved with godly fear, prepared an ark to the saving of his house; through which he condemned the world, and became heir of the righteousness which is according to faith" (Hebrews 11:7). Presented here are the keys to the success of Noah with his God. Here was the criteria of Noah's favorable acceptance with God. Yes, he was "righteous and perfect in his generation." He obeyed God in all that he was commanded, and became a "preacher of righteousness" (II Peter 2:5) only because he had great faith. In a depraved generation, when men scoffed at God, Noah rose above the infidelity and worldliness. There were no misgivings when storm warnings were hung in the clouds of heaven, nor when the fountains of the deep erupted. Noah's faith did not waver in the face of irreligion and unconcern which met his preaching. Nor was his faith quenched as waters of the deluge began inundating the earth. Total depravity had invited the wrath of God to sweep the world from its mooring, but Noah's faith was "an anchor both sure and steadfast" (Hebrews 6:19). It is no wonder that Noah's faith would prompt God to make the "Rainbow Covenant." This reveals how Noah's great faith was obtained. A warning was spoken, and Noah believed God. Notice how often it is said, "And God said unto Noah" (Genesis 6:13; 7:1; 8:15; etc.). Thus, all the faith that Noah ever had came by and through the Word spoken by the Lord. God is not capricious nor fanciful, and He still imparts faith through the same source today. "So belief cometh of hearing, and hearing by the Word of Christ" (Romans 10:17). That which comes by or through some other source is not faith. The divine pattern of saving faith is seen to be, then as it is now; "Hearing, Believing, Obeying." "Of Things Not Seen As Yet"
This reveals the realm of Noah's faith. Noah had not seen God, but he believed in Him. In all probability, Noah had not seen a drop of rain in his life, but he believed God! At least the reference is that rain had not fallen for those first 1656 years. But God has spoken, and Noah began the preparations for the greatest rain in history. That was working, obedient faith. Surely Noah could not figure out just how he was going to get a perfectly complete menagerie into that one boat, but he kept right on building. Noah could not possibly say just how the water would rise fifteen cubits above the highest peak and mountain, but when it did, Noah was ready for it. Even though these things were as yet "unseen," Noah didn't hesitate to trust God. Pity the man whose faith is not stronger than his eyesight, for this caused the flood which destroyed the world. "For we walk by faith, not by sight" (II Corinthians 5:7). When Jehovah spoke to Noah, he moved in reverence and awe to obey implicitly all that was commanded. There was not quibbling over "non-essentials" on any points that he didn't especially like or things which did not coincide with his previously held opinions. After having received a definite pattern for the ark, Noah carefully obeyed every detail: "Thus did Noah; according to all that God commanded him, so did he" (Genesis 6:22). Noah knew that the right thing could not be done in the wrong way. His carefulness to build "according to the pattern" (Hebrews 8:5) was merely a demonstration of Noah's respect for God's Word. "Prepared An Ark To Saving Of His House"
The building of an ark by the dimensions which God ordained was not a trivial undertaking. It demanded much labor, and was worthy of all caution to build "according to the pattern." So Noah put into the building of it the painstaking care of complete obedience. This was faith at work. He took God at His Word, and built just as God said. Every stroke of the axe and hammer was an open declaration of his faith. The activity did not slacken until the task was done, for his faith wavered not. held up the condemnation of an unbelieving world in bold relief. Jesus later used this same reasoning: "The men of Nineveh shall stand up in the judgment with this generation, and shall condemn it: for they repented at the preaching of Jonah; and behold, a greater than Jonah is here" (Matthew 12:41). In this same way, Noah condemned his generation who had the same opportunities to exercise obedient faith. And he shall also condemn multitudes of our time who have not rendered obedience to the Word of God. "He Became Heir Of Righteousness"
An obedient faith in God's Word made Noah an heir of righteousness, with God's blessings on him and his household. God was with Noah in the flood, but He was also with him after the waters had gone down. And all the blessings which God had purposed for mankind were made possible through him. It rested on Noah and his house to replenish the earth and preserve mankind, and that man's Redeemer should come through him. Noah's salvation from the flood became a type of our salvation from sin. "The longsuffering of God waited in the days of Noah, while the ark was a preparing, wherein few, that is, eight souls, were saved through water: which also after a true likeness doth now save you, even baptism, not the putting away of the filth of the flesh, but the interrogation of a good conscience toward God, through the resurrection of Jesus Christ" (I Peter 3:20-21). Thus water became the dividing line, for by it the ark was lifted out of the depraved world and transported into a purified world. And in the same likeness, baptism lifts us from the state of sin and transplants us into a state of righteousness and justification in Christ Jesus. "For ye are all sons of God, through faith, in Christ Jesus. For as many of you as were baptized into Christ did put on Christ" (Galatians 3:26-27). "Wherefore if any man is in Christ, he is a new creature: the old things are passed away; behold, they are become new" (II Corinthians 5:17). Friend, it is our earnest plea and hope that you will walk in the triumphant faith of Noah, as you also render complete and unquestioning faith and obedience to God as He speaks to you through His Inspired Word, the Bible.